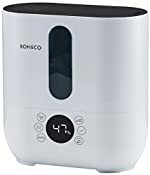 The U350 Digital Warm or Cool Mist Ultrasonic Humidifier fulfills all wishes. 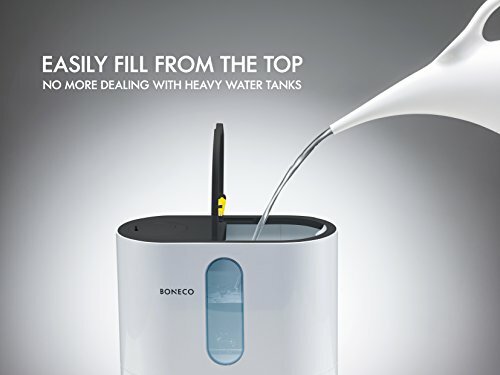 The innovative top fill design allows the humidifier to be filled on-the-spot by lifting the lid and is controlled using surface touch controls and an LED display. 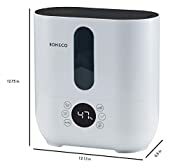 The AUTO mode automatically humidifies the room air to an optimal 45% relative humidity. This is measured by means of the built-in hygrostat which can be adjusted as desired. The U350 refreshes with a cooling mist in the summer months, and it provides fast and efficient humidification in the dry winter months with warm mist. The fragrance tray allows for essential oils to be used for individual room scenting.